In a few months the Archbishop will retire from public life, so the female DJ knew this would be her last opportunity to hear him preach. Grace was filled; expectations were high. The morning did not disappoint. She was even lucky enough to get the photo of the day – at least in her mind. 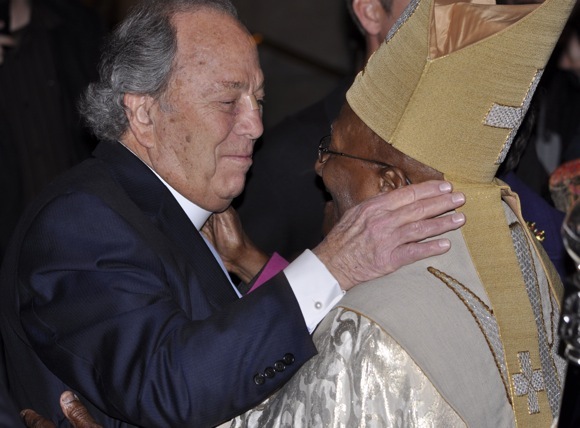 As the Archbishop was leaving the sanctuary, he paused to embrace his long time friend the Rev. Dr. George Regas, who was rector of all All Saints for 28 years, a span that included the 1980s visits by the Archbishop (who again preached there a couple of weeks ago on the current U.S. visit). 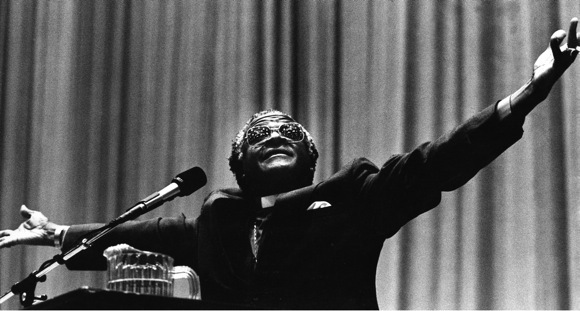 Black and white photograph of Desmond Tutu (c) Estate of Christian Gulker. Reuse without permission is prohibited. 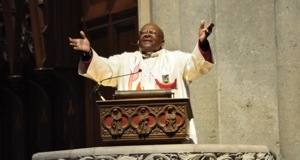 This entry was posted in Middle widow and tagged Archbishop Tutu, Desmond Tutu, Grace Cathedral, the Rev. Dr. George Regas. Bookmark the permalink. This is such an apt description of two great men. Many thanks.